My daughter was in the mood for pasta. Yesterday, I picked up a new product, Dave's Gourmet Red Pasta Sauce that promised great flavor, given that it uses heirloom tomatoes, and I decided to use it tonight. It has a little bit of oil, but only amounts to 1.5 ounces of fat per 1/2 cup serving of sauce, so I felt I could label today's dinner no added fat. There is also a new brand of lentil-based pastas called Tolerant. They are not just based with lentils, they are all single-ingredient and just have lentils! I picked up recently their organic red lentil rotini. I made a simple pasta dish with the red lentil rotini, topped with the sauce (to which I had added onion, salt, and garlic powder). I also put on a little homemade vegan "parmesan" (blend briefly 1/4 cup almonds, 1/4 cup nutritional yeast, 1/2 t onion powder, 1/2 t garlic powder, and 1/4 t salt, ensuring that there is still some texture) that we make in the Food for Life classes. The salad was more interesting than my usual salad, and was a mix of purple cabbage, bell pepper, salsa, ume plum vinegar, and red chili powder. I made a simple 2-minute pressure-cooked dish in my Instant Pot pressure cooker with carrot, kale, scallion, and peas. Dinner was great! The pasta started off deeper in orange but lightened as it cooked (as I recall, it was about 10 minutes cook time). It had a mild flavor but was good with the sauce. 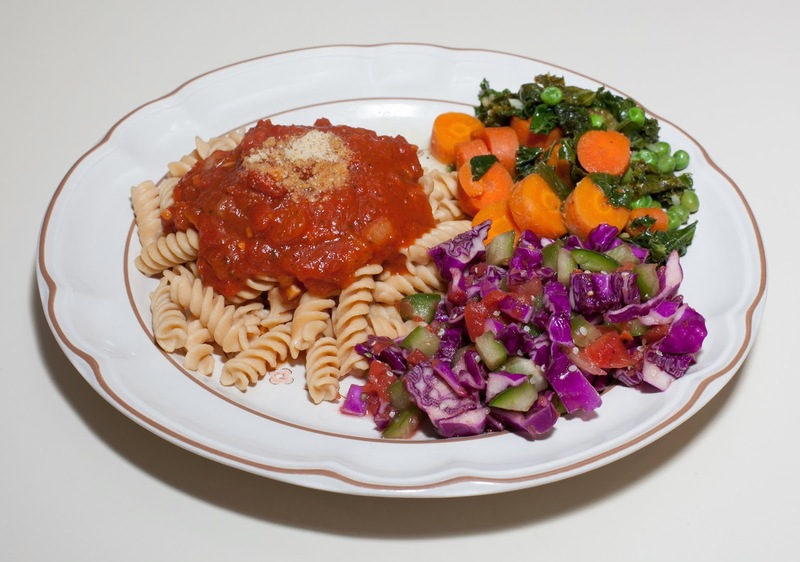 I prefer the taste and lower price of brown rice (or regular wheat-based) pasta, but this pasta has the nice lentil nutrition profile (lentils are great for fiber, protein, iron, folate, potassium, calcium, and more) - though it is a pricey pasta. The sauce was good but didn't have the flavor punch that I had expected. I wanted to try it relatively unmodified, but next time will mix in additional herbs like oregano and maybe basil, as well as garlic and maybe other vegetables. The pressure-cooked vegetables were tasty, and the salad was quite good. I put the onion slices into a large Saladmaster stock pot. I prepared the baby artichokes as I've described before: "I removed the tough outer layers of leaves till I got to fairly tight and lighter colored ones, cut the bottoms and a little more of the tops off, then quartered them and placed them in lime juice to avoid discoloration." However, instead of placing them in lime juice (I actually used Meyer lemon), I Instead quickly coated the cut artichokes as I generated them and put them on top of the onion. I added the kalettes, then the chard. I turned the pan on medium high and covered until I heard the vapor release rattling. I then turned the heat down and cooked on low for about 20m. I squeezed the lemon for about a teaspoon of juice, and mixed that in, as well as the salt and pepper. I heated the leftover vegetables and sauce, and made some maifun brown rice noodles (easy to make by boiling for 3m). I served the leftover vegetables over the noodles and put a dollop of "cheese sauce" on top. Chia and hemp seeds topped some tomato slices. Though the sauce had cashews, each serving of the sauce has less than 2g of fat, so I will call this an almost no added fat meal. It looked good and wasn't difficult to make. Dinner was good. I like kale sprouts, and this was the first time I cooked them waterlessly. Additional seasoning like black sesame seed and maybe jerk seasoning or some herbs would have enhanced the main course. I made a simple but tasty dinner. I cooked some baby navy beans (I soaked them overnight, rinsed, put them in my Instant Pot pressure cooker with just enough water to cover, and pressed the "Bean" button then the negative button twice to cook for 28m under high pressure; I added a little salt, oregano, and ginger, as well as a vegan bouillon cube, then, uncovered, ran the Instant Pot in the slow cook mode to keep it warm and cook off excess moisture for 15-25m or so till I was ready to serve) and served them with a little bit of salt in between two carrot halves. 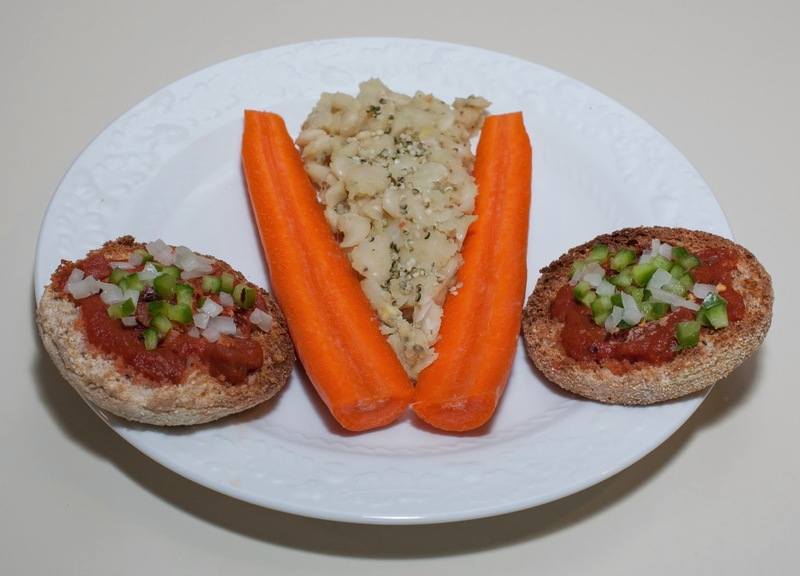 A simple pizzette of toasted whole grain English muffin topped with marinara, nutritional yeast, and vegetables, completed the meal. It was good! I drained and rinsed the beans, then, adding enough fresh water to barely cover them, cooked on high pressure for 27 minutes in my Instant Pot pressure cooker. I added the zucchini, bell pepper, ginger, and 1/2 cup onion, then cooked on high pressure for another 2 minutes. When I was ready to serve, I slowly released pressure, mixed in 1/2 cup onion, as well as the lime juice, salt, cumin, and turmeric, and served. I also had some leftover butternut squash reduction. I added a little shallot, corn, and marinara sauce, and heated it for a nice side dish. Dinner was very good! At first I said that I loved the main course - I did, but then I came to like the side course even more. 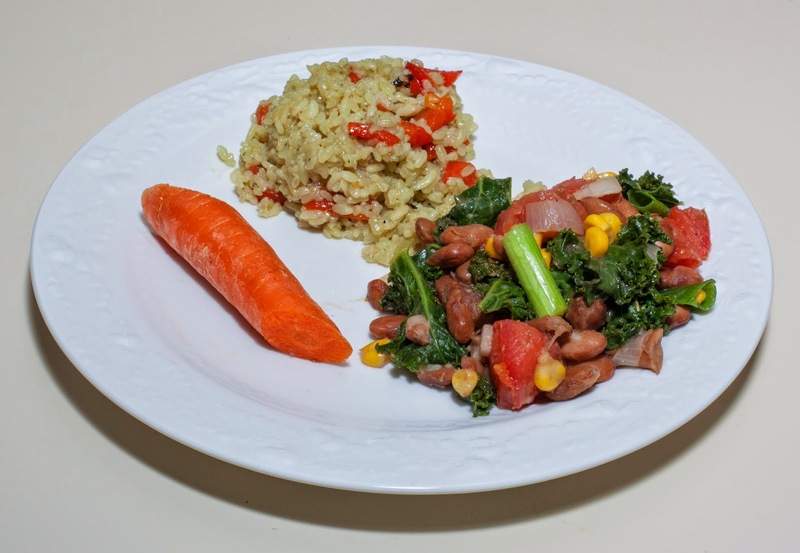 The main course was a no-brainer - how could creamy, well cooked beans not result in a nice dish? The more surprising dish was the quick side. I made for a client a thick acorn squash soup a few days ago simply by high pressure steaming for 9 minutes uncut squashes then easily cutting them open, removing the skins, then blending the pulp with some broth. On a whim, tonight, I decided to add the marinara and corn, and they both turned out to be great ideas. The marinara, besides flavor, added a unique color and tempered the bright squash yellow. The corn added good texture and flavor. I should do more with squash reductions. If I had added bell pepper, I'd have had a "three sisters" dish. I like cooked zucchini but rarely use it anymore as my daughter doesn't like it (tonight she had eaten most of her dinner when we visited a new nearby coop that just opened this past Wednesday, so I felt fine in cooking with zucchini since I knew she'd not eat much more), but hope that I can more frequently use it in my cooking. I put the wheat berries, water, and bouillon cube into my Instant Pot pressure cooker and cooked on high pressure for 28 minutes. I mixed in the asparagus, zucchini, mushroom, carrot, jalapeno, and ginger, and cooked on high pressure for another two minutes. When I was ready to serve, I slowly released pressure, mixed in the juice, onion, and salt, and served. I had some thick butternut squash that I had leftover from when I made it for a client a few days ago. I cooked it down in a stock pan a bit, adding in some garlic, shallot, and citrus-infused salt, and served it, along with tomato. I've been wanting to cook with chickpeas for a while - it's been too long! I soaked some chickpeas last night and decided to make a dish with rainbow chard that I purchased today. My thought was to cook the chickpeas in the pressure cooker, add the chard, cook for another minute, and then add raw onions. I drained and rinsed the chickpeas, then, adding enough fresh water to barely cover them, cooked on high pressure for 22 minutes in my Instant Pot pressure cooker. I mixed in the chard, jalapeno, and ginger, and cooked on high pressure for another minute. When I was ready to serve, I slowly released pressure, mixed in the juice, onion, salt, and cumin, and served. I also made white Basmati rice (1 part rice to 1 1/2 parts water simmered for 20m). I didn't use a vegan bouillon cube as I usually do for rice, as I wanted something with more of an Indian flavor. Instead, I first sauteed for just a minute or so (with no added fat or liquid in my small Saladmaster stock pan) a little onion and cumin seed, then added the water and rice. After the 20m, I turned the heat off and added frozen peas and strips of carrot, and re-covered for several more minutes. 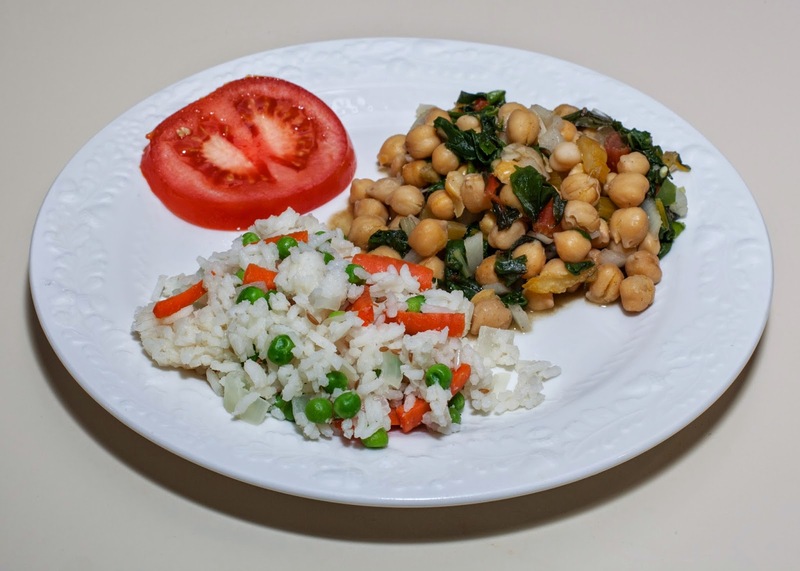 The chickpeas were great - what a treat to have some cooked-in hot pepper "heat"! The moisture was just right, the texture was good, it was all quite good. The only change I'd at all consider is to maybe soften the chickpeas just a little by increasing the initial cook time to 23 or 24 minutes. But the chickpeas were just fine as they were! The rice was good but not fluffy enough. It could have used more moisture. I think I'll up the ratio next time to 1:2. I don't cook white Basmati rice often, but will try to remember to try a 1:2 ratio of rice to water. I need to cook with chickpeas more often! By the way, I feel a bit embarrassed to admit this, but I had never made applesauce before. I rarely eat it but my Dad does, and he always likes to get one that just has organic apples and nothing else. With my daughter needing simple foods, yesterday I decided to try a simple homemade applesauce for her. I cut the core out of an apple, put it in my Vitamix blender, added a little segment of peeled and seeded lime, and, using the food pusher, pushed the apple and lime into the blades running at medium high. I served with cinnamon on top. Wow - it was the best applesauce that I've ever had, and the red skin of the Pink Lady added a pretty color, showing up like confetti. I bought some organic Granny Smith apples and want to make apple sauce in this way with Granny Smith and Pink Lady apples - the green and red color will be appealing, no doubt. I also recently started occasionally making oatmeal in my Instant Pot pressure cooker. It's simple; I put in a measure of rolled oats and twice the amount of liquid (water could do, I guess, but I use either soymilk or homemade unsweetened almond milk), add a handful of raisins and a little cinnamon, then press the "Porridge" button for a 20m high pressure cooking cycle. It gives the best oatmeal I've ever made - and the raisins bulge up and become particularly tasty. Back in 2007, I had a small experience grilling with tomatillas but, other than using prepared tomatilla salsa occasionally, I can't remember doing much cooking with tomatillas. I picked a few up today and decided to try using them in the pressure cooker. They're so moist and, though I don't think are eaten raw, I figured just a minute of pressure cooking would result in an interesting flavor. I put the tomatilla, onion, bok choy, kale, bouillon cube, ginger, and water into my Instant Pot pressure cooker and cooked for just one minute under high pressure. 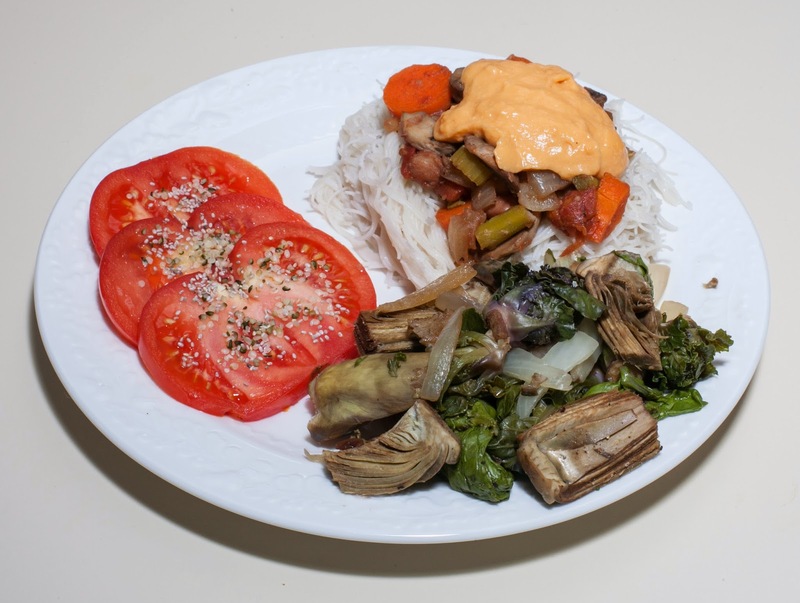 When I was ready to proceed, I slowly let out remaining pressure and added the remaining ingredients (sweet potato, roasted pepper, scallion, and spices), and served. 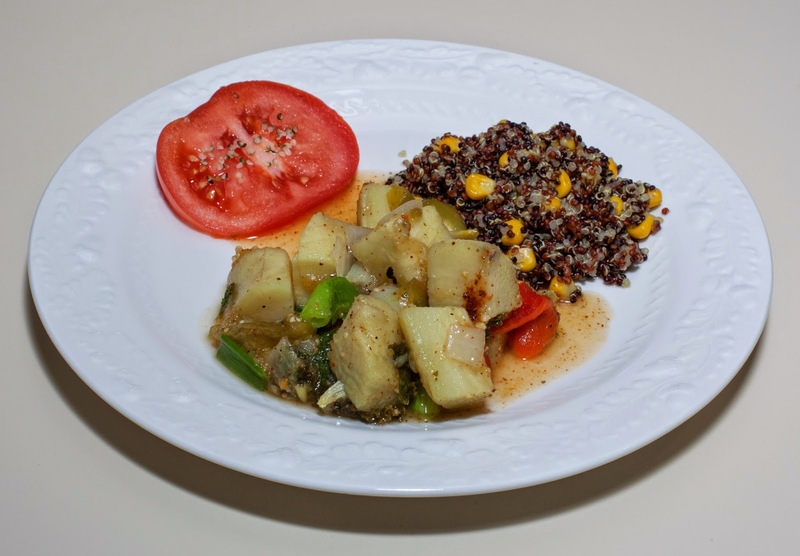 I also made tricolor quinoa with corn. Wow, the tomatilla was excellent! My wife and I loved the main course. The tomatilla added a moist and nice taste to the dish. I love white-fleshed Japanese sweet potato, which I used - the combination was great. I had made something else for my daughter today, so was free to use spice, which went well with the main course. I should occasionally cook with tomatillas! I drained and rinsed the beans then, adding enough fresh water to barely cover the beans, cooked on high pressure for 28 minutes in my Instant Pot pressure cooker. When I was ready to proceed, I slowly let out remaining pressure and served the beans to my Dad, who doesn't eat garlic. I mixed in the garlic (powder), shallot, ginger, kale, corn, bouillon cube, oregano, and lemon pepper, and cooked for one more minute under high pressure. When I was ready to serve, I slowly let out remaining pressure slowly. I mixed in the scallion, onion, tomato, lemon juice, and salt. I also made Jade pearl rice and mixed in some roasted red pepper strips that I had made a few days ago, as well as a little nutritional yeast. I was quite happy with dinner. The main course was particularly good - and the rice, as always, was tasty. I really liked the raw tomato and onion/scallion with the cranberry beans. I can't think of any way to improve the main course. The textures and flavor combinations were quite good. I should try experimenting with other dishes with raw tomato and onion mixed in. I don't generally like red beets but somehow moderately like golden ones, especially baby ones. I have enjoyed cooking with them and had good results, such as this past July. Pressure cooking cubes of maybe 1/2" or so for about 9 minutes seems to work well. I put the beet, carrot, garlic, bouillon cube, and water into my Instant Pot pressure cooker and cooked on high pressure for 9 minutes. In the meantime, I put the squash, leek, farro, second bouillon cube, 1/8 t of salt, and water into a small pan, brought to a boil, and then simmered on low heat, covered, for 10m. When I was ready to serve, I slowly let out the pressure from the Instant Pot and added the additional few tablespoons of leek, black pepper, oregano, and 1/2 t of salt. Dinner came out quite well - better than I expected. The beets and carrots were so tasty. 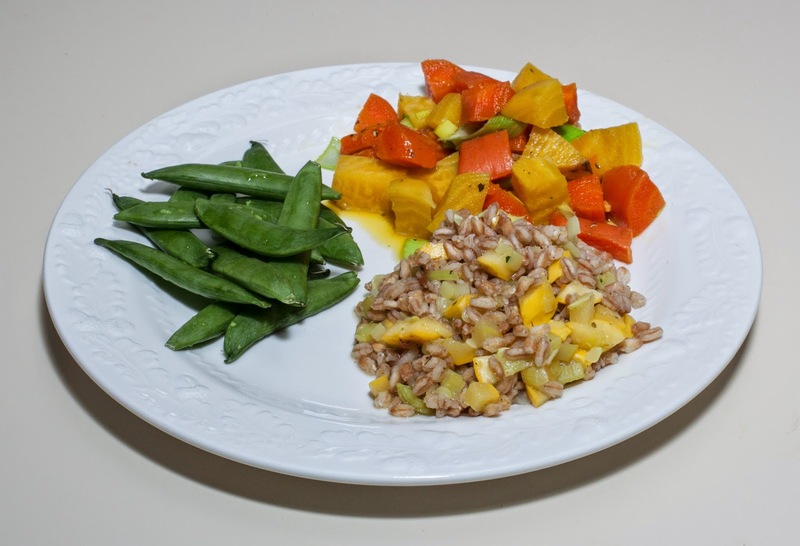 I really liked the farro and should cook it more often. I could have used a bit of ginger in the beet dish. A bit of lime juice would have been good in it, too.